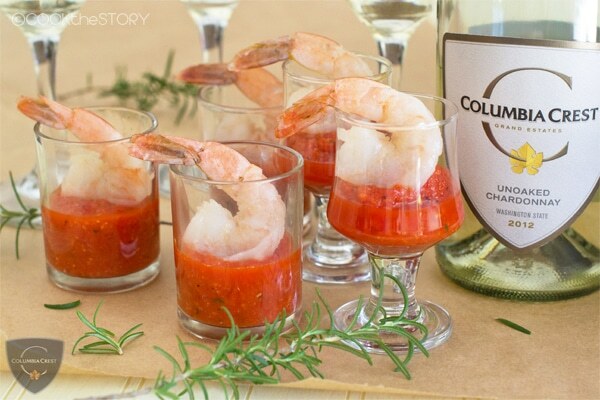 Shrimp Cocktail just got better! For this recipe the shrimp are poached in butter and the cocktail sauce has some new exciting flavors. This post is sponsored by Columbia Crest. If you love lobster, you are going to LOVE this recipe. I know, it’s strange to start a post about a shrimp cocktail talking about lobster. But for this shrimp cocktail recipe you poach the shrimp in butter and it ends up tasting like lobster. I first read about the effects of poaching shrimp in butter over here but I didn’t really believe it until I tried it. If you were blindfolded and tasted one of these shrimp, you would swear it was lobster. Both the texture and the flavor are changed by the butter. It’s really remarkable. Poaching shrimp in butter isn’t difficult. It just takes a few minutes. What you’re going to do is heat up some water in a big skillet. Then you’re going to whisk in butter a little a time, letting it melt slowly. You don’t want it to ever simmer or it will separate. You want the butter and water to become one slowly and gradually. (Note: If it does separate, I’ve found that it often come back together again when you add the shrimp. I’m guessing this is because of the water from the shrimp mixing with the sauce. Even when it doesn’t come back together, you end up with a really nice flavor and texture, just not quite as buttery. So don’t worry too much about this). Once all the butter is in, you add the shrimp in a single layer. You cook them slowly, stirring gently occasionally, just until pink and slightly curled. Use a slotted spoon to transfer them to a paper-towel lined plate and use another paper towel to blot off some of the butter off the tops. You can then transfer them to a platter or onto shot glasses (as seen in the pictures) to serve immediately or let them come to room temperature before serving. Alternately, you can keep them warm in a very low oven (200F or lower) for a little while. The only thing you don’t want to do is let them cool off completely (like, don’t put them in the fridge). If you do, the butter congeals on the outside, which isn’t very pleasant. You can use your regular cocktail sauce for this shrimp cocktail, or do something a little different like I’ve done. This cocktail sauce recipe has the usual ketchup and horseradish. But it also has pureed roasted red peppers (store-bought ones, easy-peasy) and some fresh rosemary. This makes it a little sweeter and brighter. And the rosemary is also festive for the holiday season that we’re in right now. 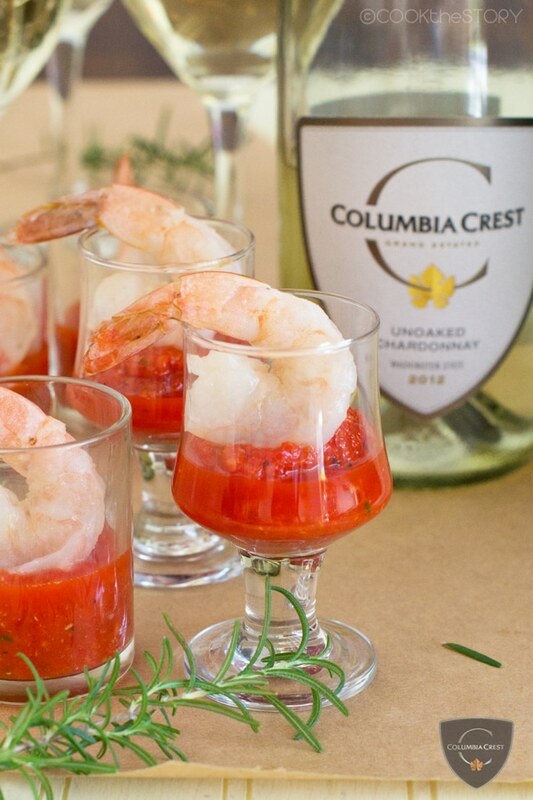 If you’re going to serve this shrimp cocktail at a holiday party, I’ve got a delicious wine pairing suggestion for you. Try serving it with the Columbia Crest Grand Estates Unoaked Chardonnay. The buttery shrimp compliments the lively acidity and citrusy notes in the wine while allowing its crisp freshness to shine through. This Unoaked Chardonnay can also be paired with mildly spicy foods which is why it works well with the touch of horseradish in the cocktail sauce. I can’t wait for you to try this recipe. I know you’re going to be as amazed as I was how much it ends up being like lobster. Tell me what you think in the comments below. Poaching shrimp in butter gives it a texture and flavor similar to lobster. To make these shrimp even more special and festive they’re served with a cocktail sauce made with roasted red peppers, rosemary and garlic. We’ve paired this dish with the Columbia Crest Grand Estates Unoaked Chardonnay. The buttery shrimp compliments the lively acidity and citrusy notes in this wine while allowing its crisp freshness to shine through. This Unoaked Chardonnay can be paired with mildly spicy foods which is why it works well with the touch of horseradish in the cocktail sauce as well. In a food processor or blender purée the drained bell peppers, ketchup, garlic, horseradish, rosemary, lemon juice, ¼ teaspoon of salt and a pinch of black pepper until smooth. Cover and refrigerate until ready to serve. Preheat oven to 200°F if desired (see Step 4 below). In a 10-inch skillet heat the water over medium heat until it bubbles. Reduce heat to low and add 1 tablespoon of the butter. Whisk gently to incorporate the butter into the water. Repeat with remaining butter, 1 tablespoon at a time, whisking until it is melted and incorporated each time before adding the next tablespoon. Each tablespoon should take about 30 seconds to melt. Adjust heat to melt it accordingly. The butter and water should form a creamy sauce, but it’s alright if it separates since it tends to come back together again when the shrimp are added. Once all of the butter has been incorporated into the sauce, add the shrimp in a single slightly overlapping layer. Sprinkle the shrimp with a pinch or two of salt. Stir shrimp gently to coat them in the butter. Cook stirring occasionally until the shrimp are pink and slightly curled, not tightly curled, 5-7 minutes. Use a slotted spoon to transfer the shrimp to a platter or pan. Blot shrimp lightly with kitchen towel to absorb some of the butter. Serve immediately with the red pepper cocktail sauce or keep warm for up to 15 minutes in the 200°F oven. Alternatively, keep the shrimp at room temperature and put them out to serve within 30 minutes. Do not refrigerate as the butter will congeal on the shrimp. Disclosure: This recipe was commissioned by Columbia Crest. They compensated me to develop the recipe, photograph it, write about it on my website and promote it on social media. All opinions are my own. I like the idea of this shrimp cocktail, it looks unique and new to the eyes of everybody. I will be perfect for wedding and other elegant occasion because of how it is served and presented. Brandy, I totally know what you mean! And I love how it’s been showing up again in restaurants. So retro but so delicious! Oh, I’ve never heard of butter poaching before, this sounds so delicious! Thank you for sharing! Aggie, Thanks for the comment! I hope you’re having a wonderful holiday season! This is my favorite appetizer of all time! Liz, I know what you mean. I love it too. And find it hard to resist it whenever I see it on a menu for sure. I hope you’re having a beautiful holiday season! 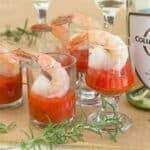 Now this is gourmet shrimp cocktail, very creative! Thanks Tina! It really is pretty special. But still easy, which has mades it one of my favorite go-to recipes this year.